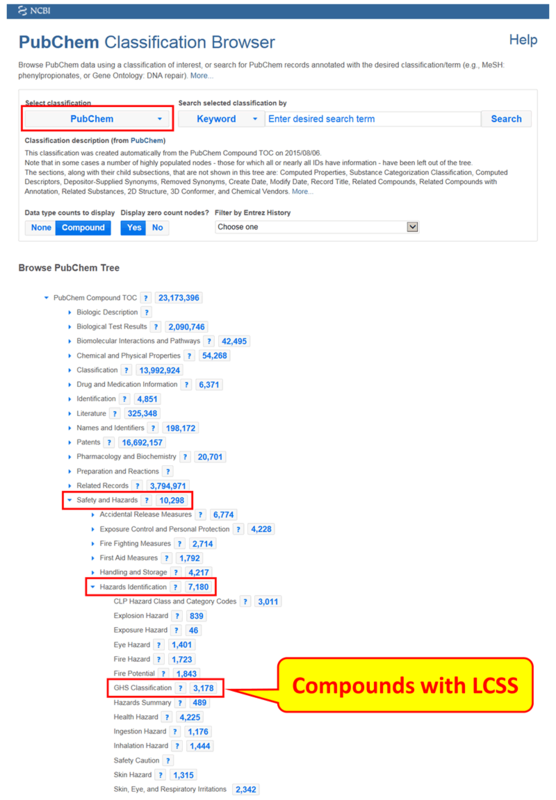 The PubChem Laboratory Chemical Safety Summary (LCSS) provides pertinent chemical health and safety data for a given PubChem Compound record. The PubChem LCSS is a community effort involving professionals in health and safety, chemistry librarianship, informatics, and other specialties. The LCSS is based on the format described by the National Research Council in the Prudent Practices in the Laboratory: Handling and Management of Chemical Hazards. Information contained in the PubChem LCSS is a subset of the PubChem Compound summary page content. It includes a summary of hazard and safety information for a chemical, such as flammability, toxicity, exposure limits, exposure symptoms, first aid, handling, and clean up. How can I access LCSS? 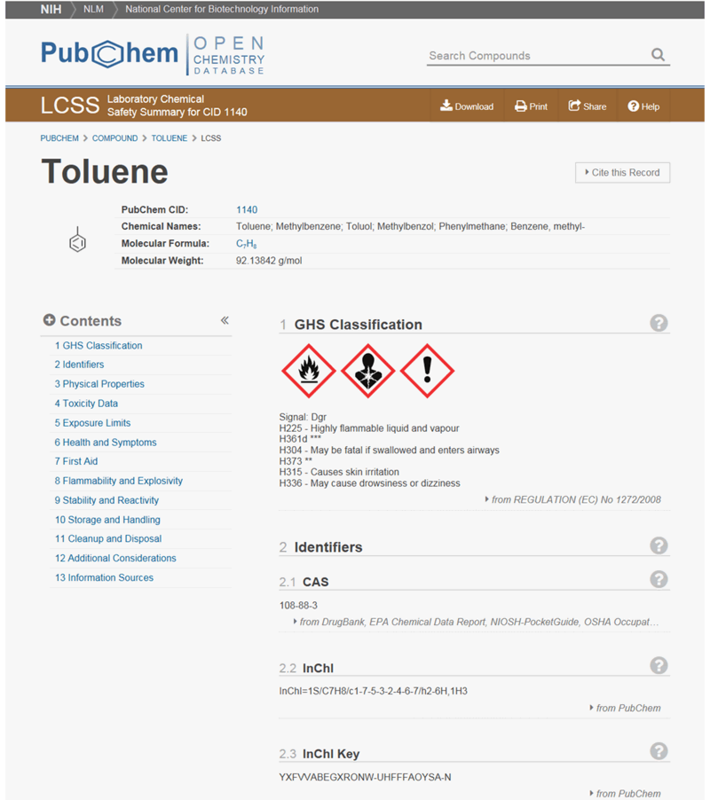 An LCSS is available for PubChem Compound records with a GHS hazard classification (Globally Harmonized System of Classification and Labeling of Chemicals). 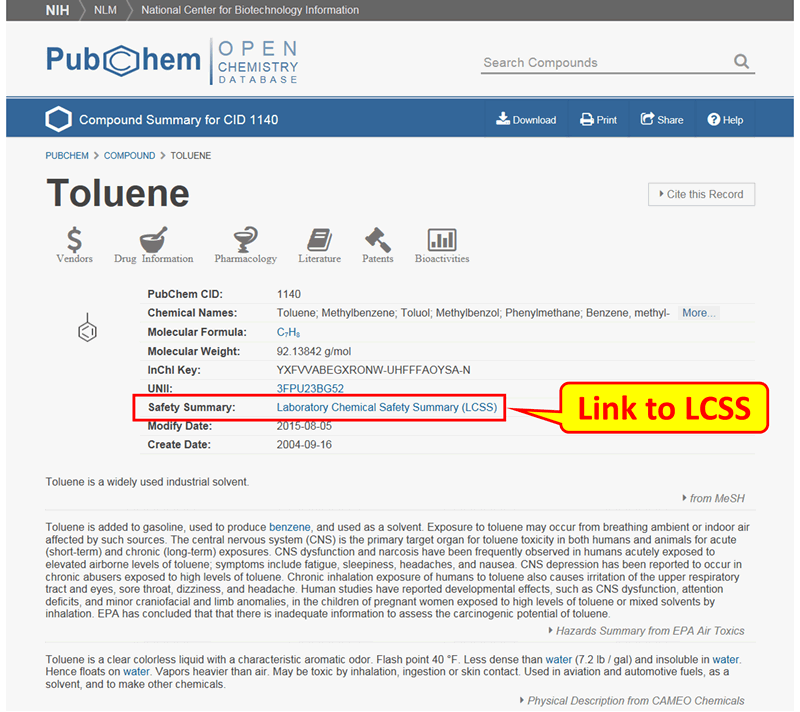 If a PubChem Compound record has an LCSS, the link to view it is provided at the top of the page under the heading “Safety Summary”. In addition, one can get the complete list of chemicals with an LCSS by visiting the PubChem LCSS webpage or by using the PubChem Classification Browser. Submitting your data to PubChem is now easier than ever. 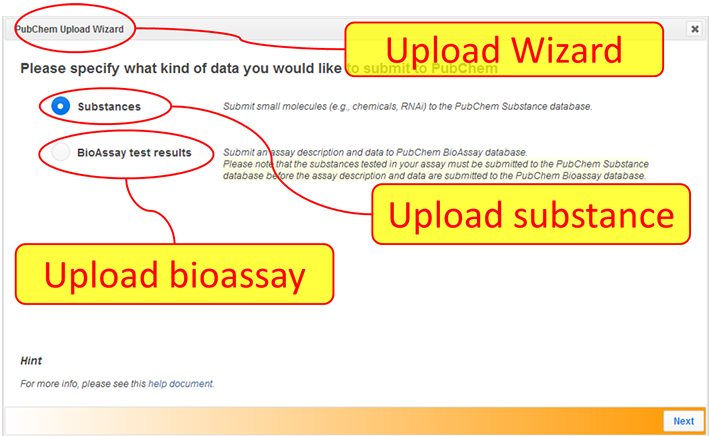 The new PubChem Upload system offers streamlined procedures for data submissions and includes an extensive set of wizards, inline help tips, and templates to assist users. 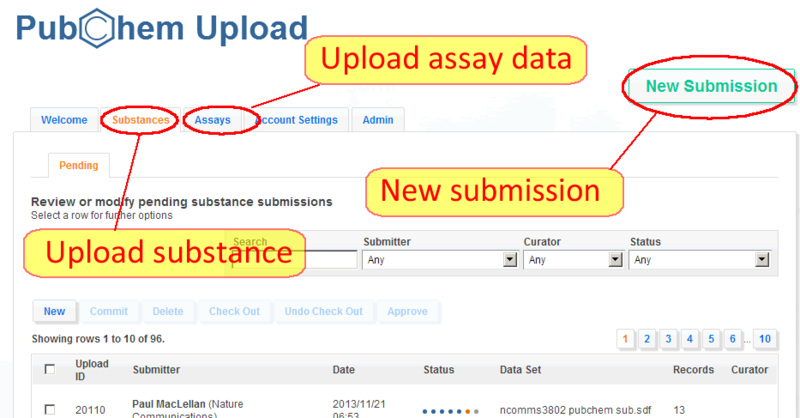 First released as a beta in April 2013, PubChem Upload is now in final form (1.0f) and replaces the Deposition Gateway as the primary PubChem data submission system. The PubChem Deposition Gateway, first introduced in April 2005, has been superseded as an interface and will be completely phased out in 2014. The means to enter data and descriptive information by web form or by file, based on user preference. Convenient spreadsheet formats (CSV, Excel & OpenOffice) as well as XML-based data specifications accommodate both one-off and frequent data providers. A “Preview” function displays incoming data to show how it will appear in PubChem before being loaded. An automated suite of validation checks help contributors identify potential issues before data is made public. Advances in web technologies provided us the opportunity to enhance the user experience by reducing the time and effort required to make substance descriptions and their associated biological activities available and useful for the public. The new PubChem Upload interface greets a new contributor who may only be interested in making a quick submission with a simple decision-tree set of wizards to guide them through the process of publishing their data in PubChem. For the experienced user, the wizards can be avoided, and the enhanced upload and editing capabilities used instead. There are many improvements over the older Deposition Gateway system. One noteworthy feature is that PubChem Upload offers an expanded ability to edit data directly in the browser. The spreadsheet editor gives PubChem contributors the ability to upload large spreadsheets with minimal reformatting and to edit those large datasets online. PubChem staff places a high importance on continuing to improve the submission process and increasing the usefulness of data to the PubChem end-user. One such direction is the use of controlled vocabulary annotations, or ontologies, such as BAO, GO, and MeSH, to help streamline the description of provided data. This may, for example, improve the ability of PubChem end-users to utilize and analyze bioactivity results. The new PubChem Upload system utilizes a RESTful model of data communication between client and server. As such, it is now technically possible to document and support the creation of upload utilities that can be incorporated into third-party software such as ELNs and LIMs. 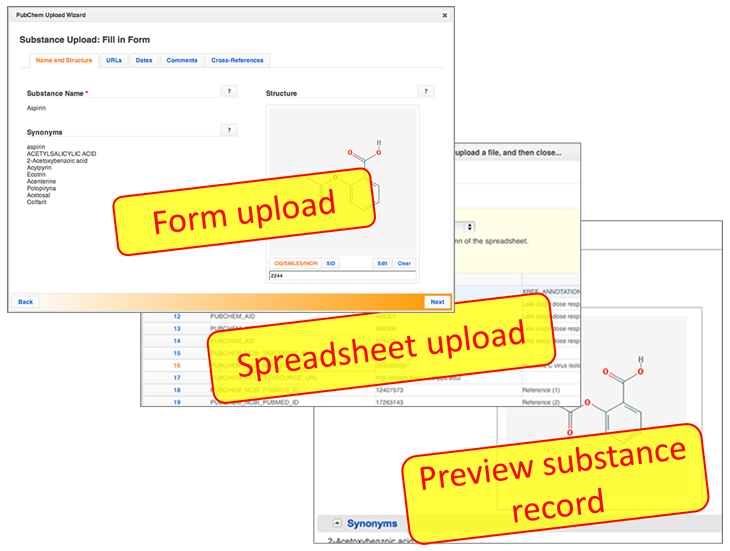 Interfacing PubChem Upload directly with a properly configured laboratory data system may dramatically reduce the effort to publish data in PubChem. Where can I learn more about PubChem Upload? 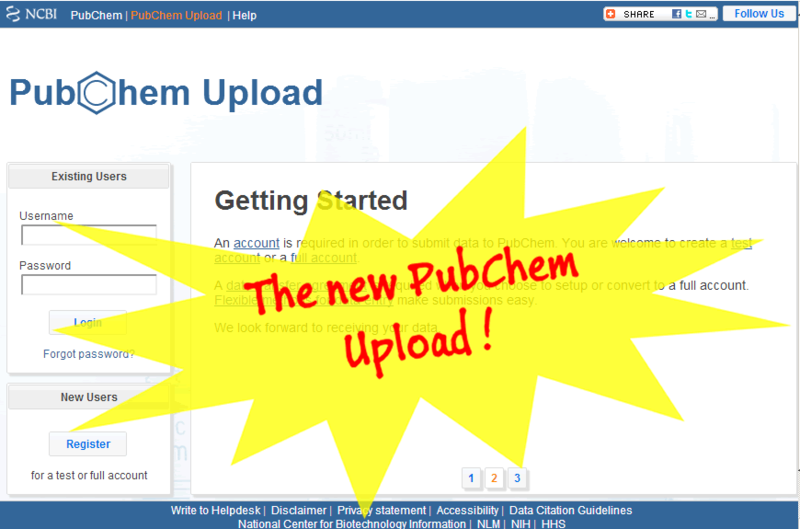 To get an overview of the PubChem Upload system, please view this presentation. To get basic information, please read this abbreviated help document. For a more extensive overview and detailed information about the features, please read the complete help document.